When planning your filming trip to Tanzania you will need to look for flights into Kilimanjaro International Airport (JRO). This airport is approximately one and a half hour drive to Arusha where you will find your overnight accommodation or our offices. KLM is one of the best airlines to use from almost anywhere in the world as they fly direct into JRO from Amsterdam, Holland. Alternatively you can fly into Jomo Kenyatta International Airport (NBO) and get a connecting flight to JRO with Kenya Airways or Precision Air. Depending on the shoot we recommend discussing the most appropriate visa with the Tanzanian Embassy you will have your film application approved. Tanzania is a vast country, depending on where your shoot will take place African Environments will suggest various forms of transport and itineraries to take into account travel. 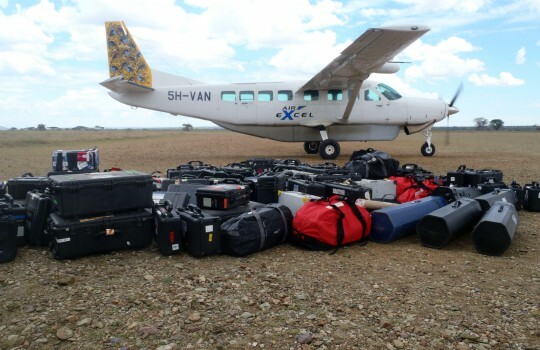 Upon arrival at Kilimanjaro International Airport (JRO) African Environments can arrange collection of the crew, as well as any equipment. Arusha is the closest town, and is also where our offices are based. Depending on your arrival time, you can overnight or carry on to the first filming location. From Arusha you can also elect to take a scheduled light aircraft out to your destination or go by road. Scheduled light aircraft have a luggage restrictions therefore a chartered light aircraft may better suit your needs. If you opt to go by road then expect the journey to take time which will need to be factored into your schedule. It is always best to consult your GP in your own country at time of travel. Yellow Fever vaccinations are only required if you are coming from certain countries. Malaria is the biggest health risk, again consult your doctor to find the current recommended prophylactic drug. The mosquitoes that carry malaria are active early morning and late afternoon/evening time. Preventative measures can be to wear long sleeved shirts, long trousers and socks. Also it is a good idea to bring insect repellent. The sun in Tanzania is very strong, a high factor sunscreen and sun hat is also advisable. African Environments provides safe drinking water on shoots, it is advised to always be wary of the food and water that is being consumed. Upset stomachs and diarrhea is a common discomfort in Tanzania from eating un-sanitized food, drinking unsafe water or forgetting to wash hands. Tanzania essentially works in two currencies; Tanzanian Shillings and USD. Most lodges and Western-style lodgings will quote in USD due to the ever-fluctuating Shilling. Your visa’s are also charged in-country in USD. When buying things from local shops, or dealing with people Shillings is an appropriate form of payment. African Environments can provide a service of buying or paying for all in-country requirements, then have this put on the final invoice. This avoids over paying, or the troubles of dealing with money while filming. For personal money or spending money note that there no ATM’s outside of the major towns and the machines can sometimes not work. It is good to bring a small amount of USD cash just in case. Tanzanian’s are generally a warm and friendly people, who will be naturally inquisitive of work you are doing in their country. Additionally most people do not speak fluent English, Swahili is the National language. It is always advised to be accompanied by a Swahili-speaking Guide, Fixer or Translator at all times. African Environments Driver Guides and Fixer’s all speak fluent English, Swahili and generally one other tribal language. Filming in some parts of the country may require security escorts or support. Although generally a safe African country, there are some issues or topics that can insight a small amount of danger. African Environments works closely with any production team and will provide advice on security measure that may need to be taken. We have existing relationships with security firms.